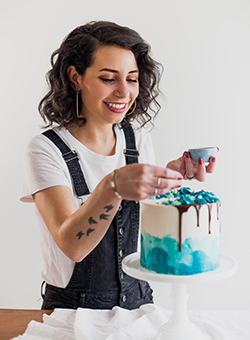 Whitney DePaoli is the blogger and cake creative behind Sugar & Sparrow. Her fascination with cake started early and was driven by the pretty pictures in her mother’s baking books, experimenting with recipes, and—most importantly—getting to taste delicious cake. While volunteering to make cakes for anyone and everyone, she began to blend her love for painting and sculpture with her love for baking and decorating. She believes that cake is the tastiest art form there is. After years of crafting cakes for weddings, birthday parties, and other events, Whitney learned a whole lot about the process of cake creation. She launched Sugar & Sparrow as an outlet to share all the tips, tricks, and recipes she has learned along the way. Whether it’s introducing someone to a new go-to recipe or helping spark their creativity, Whitney loves being part of people’s cake journeys. She believes that cake-making is such a powerful way to spread joy, which is why she is so passionate about making it accessible to everyone. When she’s not getting crafty with cakes, Whitney loves expanding her vinyl record collection, reading a good book, and going for runs through the city. 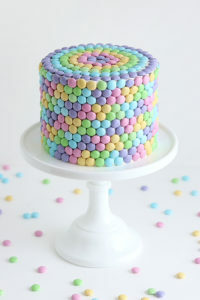 She lives in the Pacific Northwest with her husband, who inspires her cake creativity all the time. Whitney’s work has been featured on American Cake Decorating, The FeedFeed, Wilton, and Junebug Weddings. Whitney also blogs at Sugar & Sparrow.